Grenson shoes has rekindled a relationship with the Red Arrows. The upmarket Northamptonshire cobbler used to make dress shoes for members of the RAF’s aerobatic display unit, but the partnership faded. 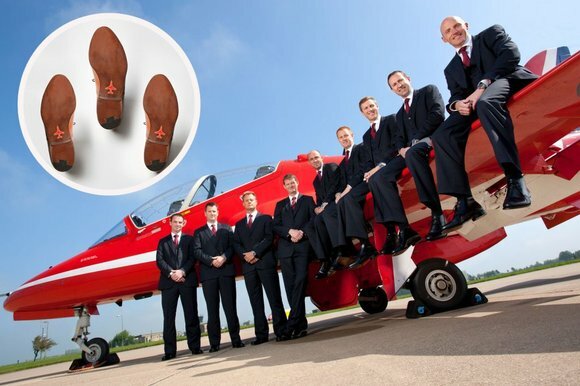 The new footwear, made especially for the Red Arrows pilots and ground crew, incorporates an airplane logo in the soles. The shoes are not available to the public. Originally founded in Rushden by William Green in 1866 and now operating from its neighbouring town Higham Ferrers, Grenson remained in the Green family until the 1980’s. For the full article please subscribe to The Times / Sunday Times. This page was added on 24/06/2013. well worth writing a comment here! Really wished to mention u did a superb work.